Prove you are Dragonborn to Delphine by slaying the dragon Sahloknir. Locate the dragon burial site. Now that you know that the Horn of Jurgen Windcaller has been pilfered from Ustengrav, follow the instructions in the mysterious note left in its place. This will lead you to Riverwood and the Sleeping Giant Inn. Speak with the innkeeper, Delphine, about renting the attic room. She will tell you that there is no such room, but you can take the room on the left. Delphine will follow you to the sparse room she indicated, where she will address you as Dragonborn and give you the Horn. She cryptically tells you that you and she need to talk and asks you to follow her. She will lead you to a room across the inn. Here she will open a secret passage in the back of a wardrobe that leads down to a subterranean room. Here she will reveal that she took the Horn to attract the attention of the Dragonborn. The note was a safeguard to protect against trickery by the Thalmor. Delphine also tells you that the dragons are not just coming back, but are actually coming back to life, resurrected from their burial mounds. Only the Dragonborn can permanently kill dragons by absorbing their souls, but she is not quite ready to accept you as Dragonborn, despite the Greybeards' interest in you. Luckily, she has a task to prove your authenticity. According to the Dragonstone map taken from Bleak Falls Barrow, the next dragon will rise from a burial mound in Kynesgrove. She wants you to accompany her to the burial site and kill the dragon; only then will she accept you as Dragonborn. If you tell her you're ready to leave, she will put on her gear and leave the inn. You are free to follow Delphine to Kynesgrove, or you can go at your own pace and possibly beat her there. As soon as you get to Kynesgrove, Iddra, the innkeeper, will run up to you and tell you that a dragon was sighted flying over the burial mound and that you should get out of town. If you traveled with Delphine, she will run up ahead of you to the burial mound, fearing it may be too late. If you arrived ahead of her, she will appear shortly on the mound, behind you. 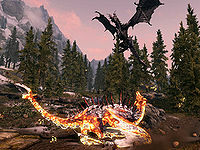 Upon arriving at the site, you and Delphine will witness the dragon, Alduin, using his Thu'um to resurrect a dead dragon. When the dragon, Sahloknir, is whole once more, he has a conversation in the dragon language with Alduin. Here, Alduin attempts to speak to you, addressing you as Dovahkiin. After ordering Sahloknir to kill you, Alduin flies away. Delphine will help you kill Sahloknir, and upon his death, when you absorb his soul, Delphine will be quick to acknowledge you as Dragonborn. Speak to her and she will tell you everything that you want to know; revealing that she is one of the last members of the Blades. She will then talk to you about her suspicions regarding the Thalmor, who stand to benefit the most from the return of the dragons. Finally, she will reveal her plan to infiltrate the Thalmor Embassy, starting the next quest, Diplomatic Immunity. While A Blade in the Dark is active, dragon locations will be limited to dragon walls. Other than dragon walls, random dragon encounters are eliminated while A Blade in the Dark is active allowing for controlled access to dragon fights. Despite it saying you need gold to rent the "attic room" (and Delphine taking said gold if you do), you do not actually need the gold on you to progress the quest. When Delphine goes to put her traveling gear on at the start of the quest in Riverwood, she will stand next to the chest although the chest beforehand states that it is empty. Delphine will not acknowledge your status as Dragonborn if you slay a dragon that is not Sahloknir, despite any soul absorption. You can happen upon the burial site any time after Delphine leaves Riverwood. The quest will progress once you arrive. Standing too close to the burial mound when Alduin revives Sahloknir may cause you to be thrown aside in a manner similar to the Unrelenting Force shout. Though you can likely pick yourself back up before Alduin's and Sahloknir's conversation ends and the battle begins, you can be thrown off the hill and take fall damage, so be careful. In the time between the quest "A Blade in the Dark" and the quest that follows, Delphine will appear in the Bannered Mare in Whiterun and fuss at the Dragonborn for not meeting her in Riverwood as she said to. After renting the "attic room", Delphine may enter your room but not speak, breaking the rest of the quest. This can be fixed by typing setstage mq106 30 in the console, depositing the Horn of Jurgen Windcaller in your inventory and skipping to Delphine's 'we need to talk' dialogue. Sometimes when you reach the dragon burial mound, Sahloknir will not fully emerge from the ground, and does not die when his health reaches zero. This can be fixed by walking far enough out of the dragon's range, which extends as far as Kynesgrove, and walking back. Talking to Delphine after slaying Sahloknir and absorbing his soul may not trigger the quest update. Using the console command setstage MQ106 155 can correct this. Follow up with setstage MQ106 160. If Delphine is still not responding, the main questline can be forwarded to the beginning of the Diplomatic Immunity quest by using completequest MQ106 followed by setstage MQ201 30. This will cause Delphine to run back to the Sleeping Giant Inn in Riverwood, where her dialogue will be reset for the new quest. It will also add Delphine's Secret Door Key to your inventory. Sometimes, you may not be able to absorb dragon soul until you complete the quest. ? Sometimes, when Sahloknir emerges he may have his skin already attached. The effect of his skin returning still plays. 200 Finishes quest Delphine believes that dragons are coming back to life and that only the Dragonborn can stop them. It turns out that she was right. Near Kynesgrove, we saw a dragon Shouting another one back to life. After we killed the dragon and I absorbed its power, Delphine accepted that I was Dragonborn as she had hoped, and revealed that she is one of the last members of the Blades, an organization dedicated to protecting the Dragonborn and stopping the dragons. The following empty quest stages were omitted from the table: 0, 1, 5, 10, 20, 25, 32, 35, 40, 42, 45, 47, 48, 55, 58, 60, 65, 70, 72, 75, 80, 90, 100, 105, 110, 120, 155, 160, 170. On the PC, it is possible to use the console to advance through the quest by entering setstage MQ106 stage, where stage is the number of the stage you wish to complete. It is not possible to un-complete (i.e. go back) quest stages, but it is possible to clear all stages of the quest using resetquest MQ106.